1. The most common sentence pattern is to write the subject first, followed by the verb: Weeds are important too because birds eat the seeds. 2. Reverse the sentence to begin with the dependent adverbial clause: Because birds eat the seeds, weeds are important too. 3. Begin a sentence with an infinitive phrase used as an adjective: To get a head start, he arrived 20 minutes early. 4. 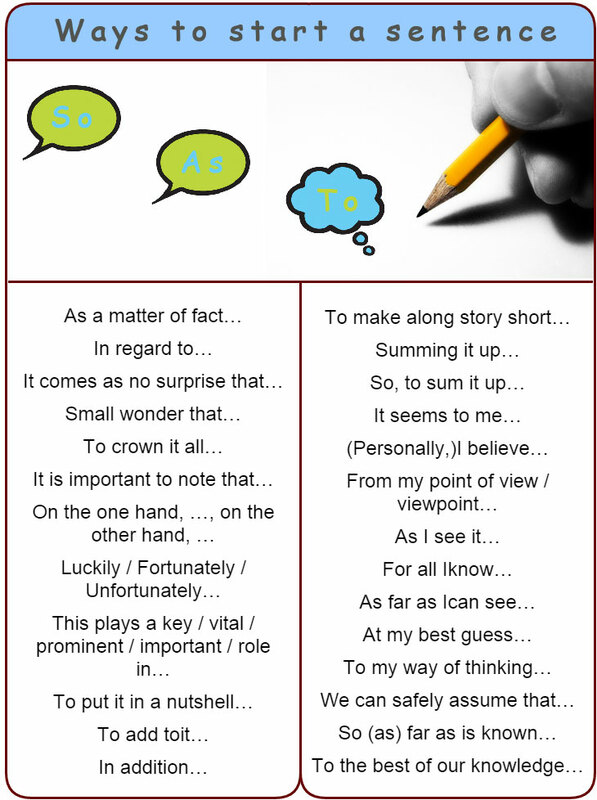 Use an infinitive phrase as a subject: To get a head start was his goal. 5. Begin a sentence with a prepositional phrase and end it with the subject: From out of nowhere came a loud shriek. 6. Begin a sentence with an adjective: Sad about being alone in the house, the puppy lay down and waited by the front door. 7. Begin with an adverb: Regretfully, I will not be able to attend the wedding. 8. Begin with an "ing" participial phrase: Muttering to himself, the old man shuffled throughout the house. 9. Begin with an "ed" participial phrase: Angered by the long wait, I slammed the phone down on the receiver. 10. Start with a transitional word: Finally, we found the lost keys.